What are the economic realities of being Asian American? For the many answers to that question, a new report was released today. It’s filled with interesting details, including comparison numbers for Latinos, blacks and whites. With a population of 17 million, Asian Americans account for 6% of the people living in the U.S. — as well as 6% of the nation’s businesses and work force. Folks from India have the highest median wages ($55,178) in the country. Bangledeshis have the lowest ($22,071). The recession slammed everyone but especially families of color. Median household net worth plunged by 59% for Asian Americans, 60% for blacks and 61% for Latinos. By comparison, the drop for white households was 24%. The Asian geek is more than a stereotype. Fully one fourth of all Asian Americans work in Science, Technology, Engineering and Math. If you want to sound like an in-the-know geek, then you can refer to this job sector as STEM. Meanwhile, 25% of all nail salon and personal care employees are Vietnamese Americans. Asian American buying power (largest consumer markets are California, New York, Texas, New Jersey and Illinois). White and blue collar employment trends (both are expanding). Business activity (entrepreneurs rule, with $506 billion in revenues). Much of the basic data used in the report has been floating around in random places for a while. But analyzing the stats and pulling everything together in this new publication provides a fresh, informative and reader-friendly perspective. Most of the numbers are from government sources, especially the U.S. Census. The downside of this is that the Census doesn’t really have a category for Middle Eastern folks, which means the stats on this group of Americans is weak. 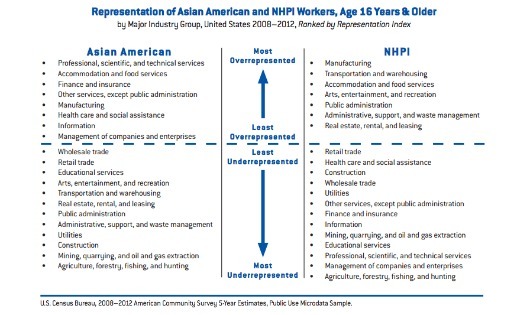 But the demographics on Asian Americans are getting better, more comprehensive. A study like this can help the community gain visibility in the numbers game. Its goal is to arm community groups with data they need to organize politically, bootstrap local businesses and tap into government grants, according to Howard Shih of the Asian American Federation. In a demonstration of bi-coastal solidarity, AAF co-published “Making America Work” with California’s Asian Americans Advancing Justice-Los Angeles. I think the report will also be useful to regular citizens who want a snapshot of what Asian America looks like. Students will like it too, as will marketing types . The report was unveiled this morning in midtown Manhattan at a presentation for about 50 community leaders. The event also included a panel discussion. Once people got talking, they wouldn’t stop because they were passionate about the issues. Thankfully, MSNBC news anchor Richard Lui moderated. As a guy who appreciates a 10-second sound byte, he kept things moving. With the lively pace, I learned a few more interesting facts about life in an America fueled by immigrant growth. It reminded me of how much things have changed from my Chinatown childhood. And yet, many issues remain the same: The constant influx of new arrivals makes for a rough, raw culture. Without citizenship, access to political clout and government resources is a difficult. There’s also a tremendous need for English language training. Flushing, Queens — NYC’s second Chinatown — is one of the few communities that grew during the recession. Over the past decade, it expanded 30% to 40%, with employment increasing by 3%, according to John Choe of One Flushing, an economic development organization. His group is launching a pilot English language training program and has room for 50 students. For more info, contact oneflushing.org. Many of Flushing’s Asian restaurants don’t take credit cards. This is true of immigrant communities in general, said Sara Tang, a vice president at Bank of America, which provided one of the three grants that funded the study. These businesses also struggle to get loans because they “under-report their financial strength,” she added. She didn’t explain but we knew what she meant. In a cash economy, business owners under-report what they make to avoid paying taxes. Unfortunately, looking like you’re not making money means that bankers can’t tell that you earn enough to meet monthly loan payments. Okay, okay — I’ll stop now. 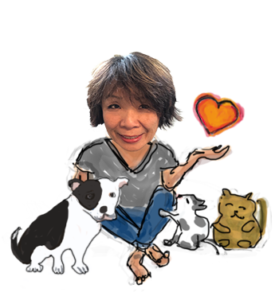 I hope you’ll share this post and download a free copy of Making America Work: Asian Americans, Native Hawaiians and Pacific Islanders in the Workforce and Business 2014. Lots to think about.